Update Oct 3 - Check your emails, I was chosen to try the foundation! 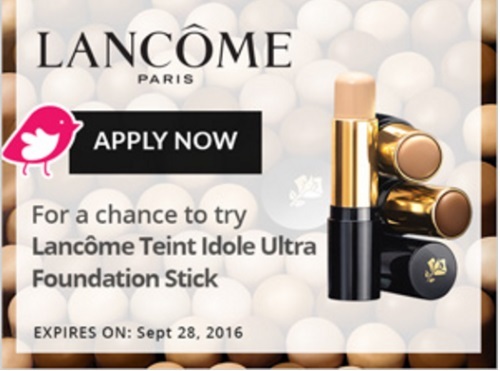 Sept 22 - Chickadvisor is looking for 100 Canadian ChickAdvisor members to try the Lancôme Teint Idole Ultra Longwear Foundation Stick before it launches in Canada this October! Click on the link below to take the qualification survey for a chance to be chosen to try out this beauty product for Free! Selected members will be contacted by email during the week of September 26, 2016. Be sure to add "PRC@ChickAdvisor.com" to your email address book to ensure that you receive all future communications. For extra consideration make sure you spread the word on social media and remember to include #LancomeTIUstick when you post on Twitter, Instagram and Facebook. Show your makeup skills by tagging in your social media pics! Not a Chickadvisor Product Review Club member yet? Sign up here for free.